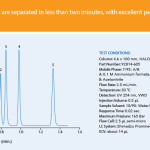 HALO® columns are designed with 90 Ångstrom pores for small molecule analysis. 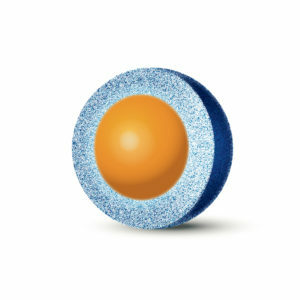 They are made using 2.7-mm Fused-Core® particles with a thin 0.5-mm outer porous shell to provide superior performance compared to totally porous particles. 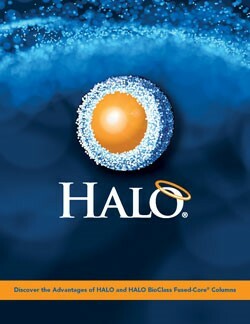 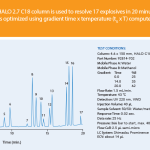 The 2.7-mm particle size also allows HALO® columns to be used with both UHPLC and HPLC instrumentation for high speed or high resolution analyses. 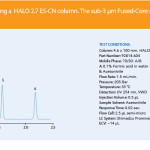 With a 2-µm inlet frit, HALO® columns are excellent for R&D and routine analyses due to their ruggedness and reliability. 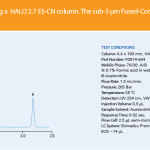 HALO® columns are available in six phases for reversed phase separations and two phases for Hydrophilic Interaction Liquid Chromatography (HILIC) separations.